1Pat the lamb dry with paper towels, then combine the mint, rosemary, garlic and enough oil to make a runny paste, and smear it all over the lamb. Sprinkle with salt. If you have time, cover and refrigerate it for a few hours, or overnight. 2Heat a large, heavy skillet with a drizzle of oil over medium-high heat and brown the lamb on all sides. 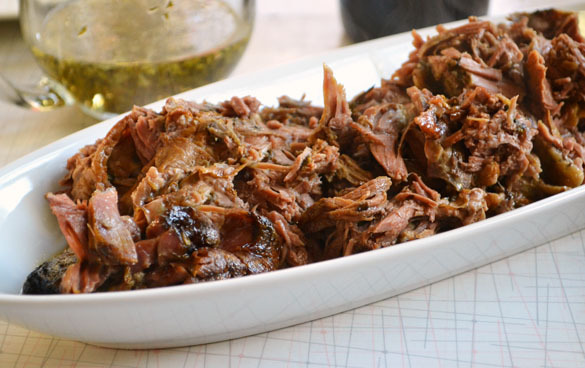 Transfer to a slow cooker and cook on low for 8 hours. (If you like, add a glassful of red wine or chicken stock, but it's not necessary - the slow cooker will contain all the juices from the meat and cook beautifully.) Serve hot, with mint sauce.